I have been watching people walk along the driveway, now (as of a few days ago) lined on both sides with a dozen Kohlreuteria – Golden Rain Trees. The trees are about 6’ to 8’ tall now, nowhere near their future majestic 20’ -25’. And yet, one can see that the visitors are aware of the driveway in a way they weren’t before the trees went in. They, and I also, walk more deliberately, more experiencing of the driveway and its goal: the house at the end. The house is no less visible than it was a week ago. But here is the difference: now it isn’t just ‘over there’; the approach itself has become a sensory and visual experience. Almost everyone who now visits and strolls through the garden “gets it” this way in some sense. It is still very raw; there are now lots of baby trees and shrubs everywhere, but they truly are babies. It will be several years before the actual spaces created by the plantings start to take shape. 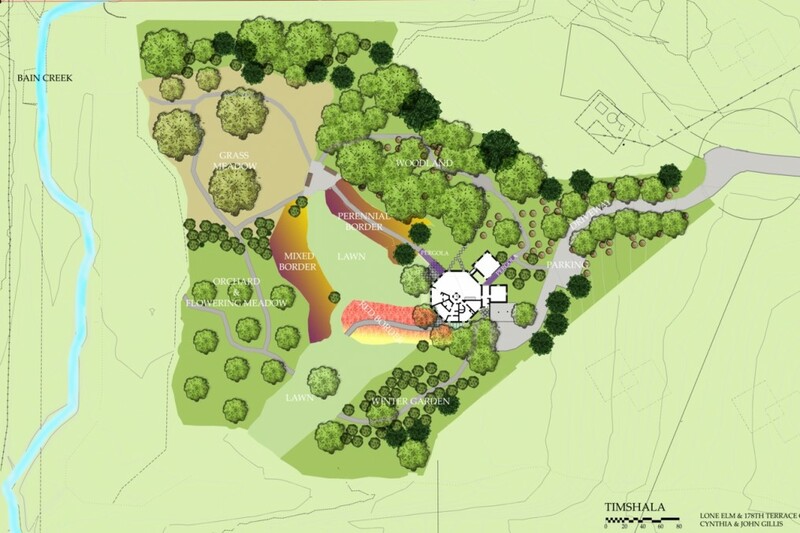 The woodland will be defined by the shade created by large trees and the layers of understory trees and shrubs and groundcovers. The orchard trees will be their own space, with a low-growing colorful grassy area defining that space. And so on, for each of the areas we have planned. And yet, visitors already seem to experience those spaces and shapes, which will actually come later. Here is what I think is the reason: the one thing is complete is the paths. And in a sense I think this – motion — is the essence of what makes the garden a garden. This is probably true for every garden. In a garden, motion is the interplay between plants and us. The plantings define the spaces; the paths and openings help define the plantings. Motion takes place at many levels. We have the driveway; the major 4’wide walking paths; the large stepping stone paths; the mown paths through grasses and meadows. A different kind of level is within the plantings themselves. Even where we don’t actually walk, we can create a sense of motion with plantings that move the eye. For example, you don’t actually step through a “trail” of Hostas winding through a large bed of ferns – but your eye does. The pop of red from poppies waving in a distant meadow causes you to change the focus of your vision to the meadow, another kind of motion. I think of these as mental motion. And I think this is why so many people are enjoying the garden, immature though it is. This entry was tagged Driveway, Garden design, Golden Rain Tree, Kohlreuteria, maturing plantings, motion, Paths, spaces, stepping stones, Trees. Bookmark the permalink. Thank you for your encouragement to think of such things. Yes, movement, motion, and the heightened expectation of something that is in a flux. The mental motion, as you’ve said here. Also, I have never heard ‘goal of the driveway’ used before, charming, to the house, hello the house! I suspect it is the language of the purposeful and dreamy imaginations of the architect, landscape and otherwise. Thanks Barbara. Glad you enjoyed my design musings. Yes, motion is a wonderful part of the design.